Get either a high mileage or a fully synthetic oil change from Firestone Complete Auto Care before May 31st to qualify for this mail in rebate. Receive a $10 check for purchasing Kendall GT-1 high mileage motor oil or get a $15 check back for getting a fully synthetic oil change. 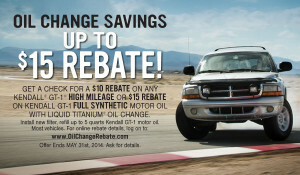 One Response to "High Mileage/Synthetic Oil Change Rebate"